Buster is a gorgeous, loving boy who has sadly found himself with no family to call his own due to various changes in circumstance. He is longing to be loved and will make a delightful addition to most families with the time to give him what he needs…long walks, plenty of company and playtime! 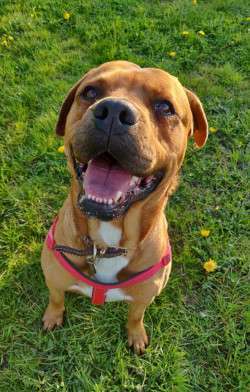 He is used to older children, but due to his size he can be a little boisterous, therefore we would recommend children to be over 10+ or a home with adults and teens. He is fairly well socialised, getting along well with most dogs, however at this early stage we feel he would prefer to live as an only dog. Could you offer Buster the forever home he deserves?